3.1 So how do balance bike really works? 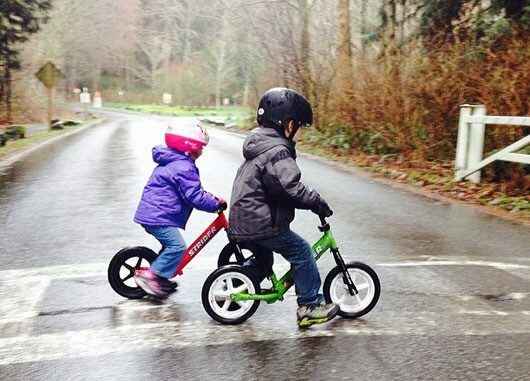 4 What to Look for in A Balance Bike. As you already know by now, there are different materials used to make these bikes. Some are made out of steel, others aluminum, others wood. Most of the time, the type of bike you will choose will depend on what you think looks great and not what will actually be great when your child is using it. You need to remember that the best balance bike for your toddler is different from the usual bikes. 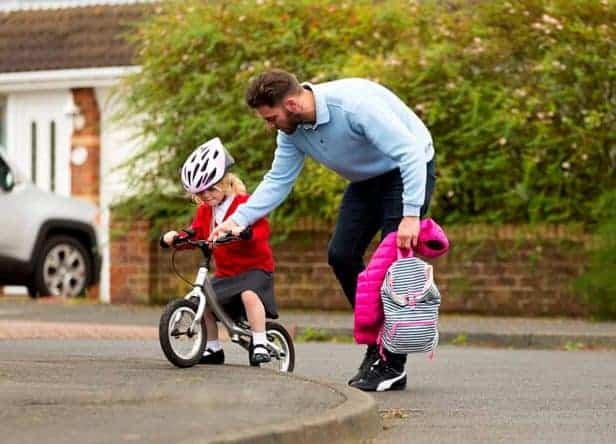 Because it doesn’t help your child to ride and go great distances but helps to have a sense of balance in preparation for using a regular bike in future. So, with that said, in an effort to try and make your life a little bit easier, I present you with the top five suggestions of the best balance bikes for your toddler on Amazon. 1.5 to 5 Years Old. 2.5 to 5 Years Old. 2.5 to 6 Years Old. 1.5 to 3 Years Old. This bike has some awesome features but since this is not what I’m focused on for now, what you need to know is that your 18-month-old to your 4-year-old can comfortably start riding this bike. 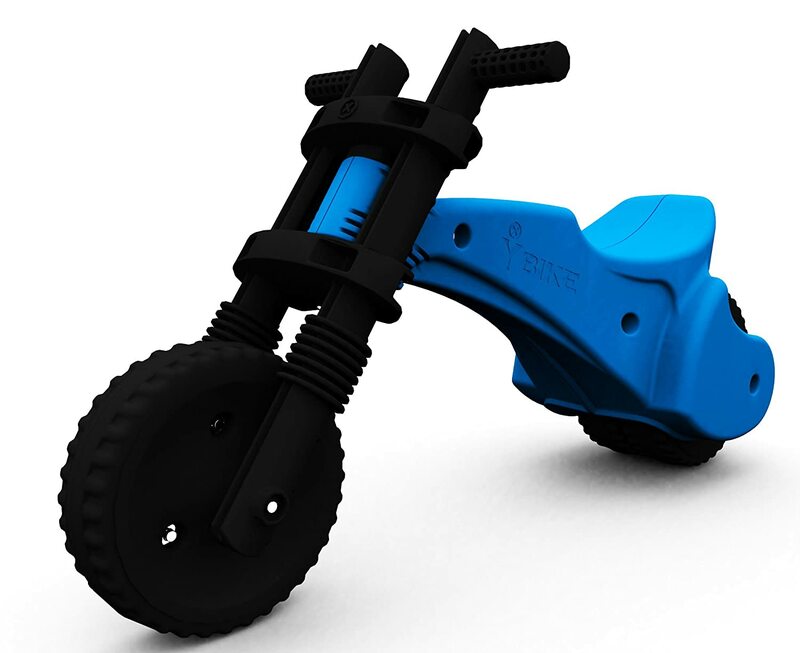 It’s pretty light, so your toddler will not have a problem riding it or dragging it. This bike is well made and long lasting. The seats are adjustable meaning your child can grow with it. Your child can ride it almost anywhere. He can learn to ride at the soonest time possible. This one is perfect for your 3-year-old toddler and above. Although this may vary depending on the weight and height of your toddler. 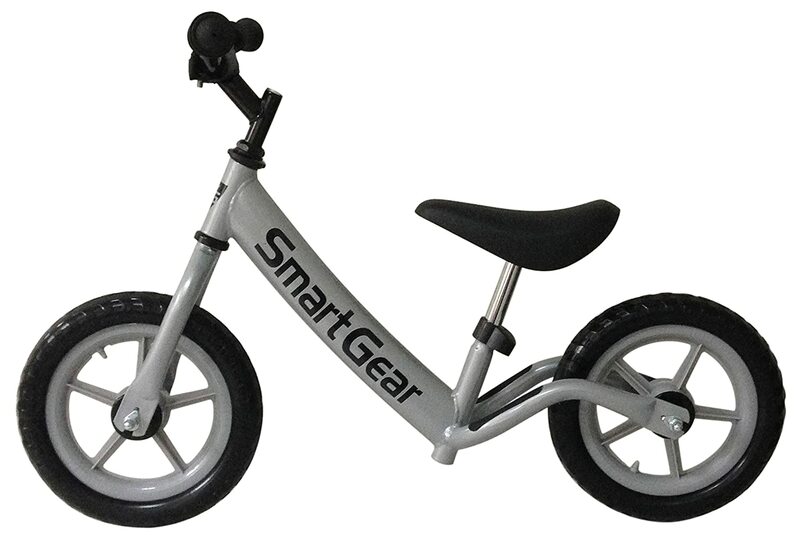 This one is one of the best balance bikes for your toddler aged 2 years old and above. This one will appeal to your eyes. It has two rear wheels that ensure more stability. However, the seat bike is fixed which means that it will be hard if your child is too small or too big for this bike. 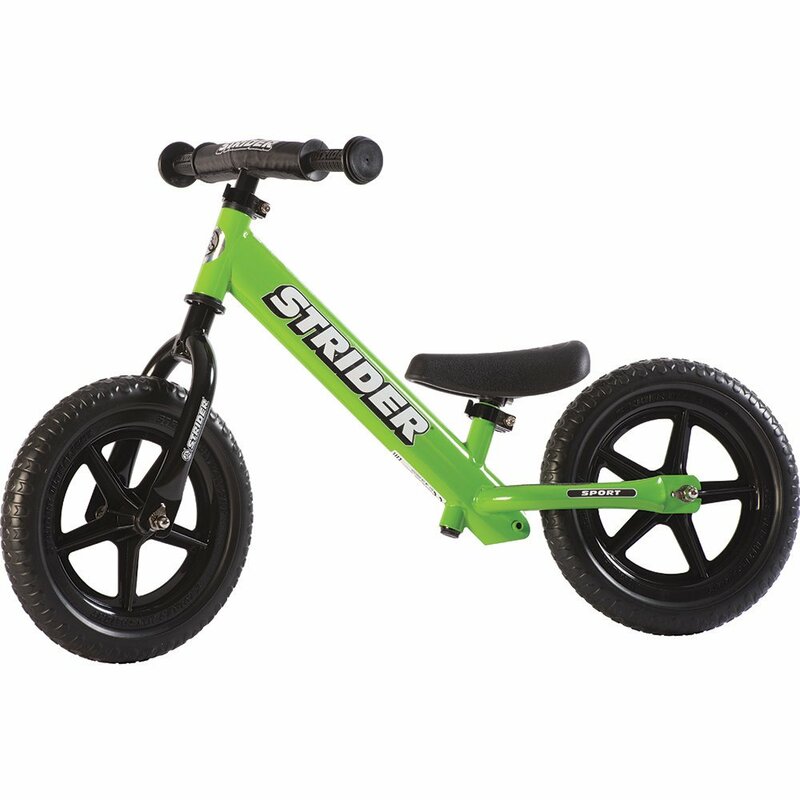 For short toddler, I would choose either the Strider or Cruzee as it has the lowest seat height as well as lightweight compared to other brands. Click the images to Learn More. Before you get any ideas of just taking off the pedals from a sibling’s bike and voila! Your child now owns a balance bike, Hold your horses! The best balance bikes for toddlers are lighter than the usual bikes. So taking off the pedals from a sibling’s bike wouldn’t work. It won’t make it a balance bike because balance bikes are supposed to be way lighter than the usual bikes. So, should you really buy one? Well, if you ask me, balance bikes are an ideal solution for you if you have kids who are eager to spend time outside, learning to ride a bike but are still afraid of the balancing factor. This scare makes it difficult for your child to learn and that’s exactly where balance bikes come in. They are the easiest way to teach a kid to ride a bike. They allow your child to master balancing without the fear of falling. Clever, don’t you think so? When your toddler is learning how to ride a bike, the most important thing they need to learn is how to balance it. When they learn how to balance it then the rest, as they say, is easy like cake. You know every kid can learn how to pedal easily, right? But you should also ensure that your kid can balance the bike as well. This is the most crucial part. So, this is where a balance bike comes in. Balance bikes come in many different sizes. The smallest bikes can fit your 18 month old, while the largest is for adults. It’s interesting to know that they don’t come with push bars for you to use to assist your child. There is actually no need for one as your child can ride a balance bike from day one, all on their own. But with your supervision, of course. Cool, huh? So how do balance bike really works? Pretty simple, allow me to explain how. Well, the idea behind a balance bike is that instead of your toddler trying to master how to do three things at the same time, that is learning how to pedal, balance and brake all in one go…sounds tough when you think of it that way, right? Your child will have already learned how to balance a bike for when they are ready for the pedal bike. So as a parent you get to save your toddler from the frustrations of learning how to ride a bike for the first time. When using the balance bike, your toddler learns to balance by just sitting on the bike and pushing himself using his feet. Well, it is. Soon your toddler will start to whizz along with both feet off the ground, learning how to steer and balance as their confidence grows. Then the beauty of it is that the balance bikes are pretty lightweight as compared to the usual bikes. Yes! By taking the pedaling out of the equation, your toddler is able to focus on the much more important and difficult task of starting off, balancing, steering and stopping. So when your child learns to do all this using the balance bike, they can then easily transition to the pedal bike. So, you know what this means right? You can skip the trainer wheels! Did I just say the magic words? I bet I did! Now that you realize the benefits of one, the next thing is to make sure you get the right one. What to Look for in A Balance Bike. 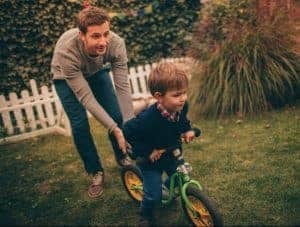 As a parent who has been shopping around for the best balance bike for your toddler, I’m sure you’ve realized that there are so many balance bikes in the market. This makes it harder to decide on which one to buy for your child. Here are some of the things that you should look into to guide you. So how do you select the perfect size bike for your child? First things first, don’t buy a balance bike for the future! As tempting as it may be! Buy it for the now. Can I tell you a little secret? Well, your toddler will simply never ride it unless it fits them. And if that’s not convincing enough, the better the bike fits, the safer it will be. Sit on the saddle while resting the balls of both feet on the ground. Straddle the top bar with a comfortable clearance and with both feet on the ground. Reach the handlebars with just a slight bend in the arms when sitting on the seat. In case the balance bike has hand breaks, let your child be able to comfortably grasp them and be able to apply enough pressure to stop the bike. Age is another important factor. Because, as you already know, some 2-year-olds are the size of 4-year-olds and vice versa, right? The other way to determine the right size is by using clothing size based on height to determine the best balance bike for your toddler. How do you get to find out what the ideal seat height is? To figure this out, ask your child to take off their shoes. Now let your child hold a hardcover book between his legs and then raise it up to his crotch. This way the distance between the ground and the book will give you the seat height. In addition, you can use a tape measure for this. This type of measurement is called inseam measurement. Once you have your toddler’s inseam height, you can use this to decide on the ideal seat height. How you ask? It’s ideal to purchase a bike with a maximum seat height of at least 2 inches above your child’s current seam. Next, you need to ensure that your little rider can place both feet flat on the floor. This will show that your toddler is comfortable enough to start riding. A question you might ask yourself…will the balance seat grow with your child? On this, I would advise that before you buy that balance bike, you should check with the manufacturer’s guidance to confirm whether the seat is adjustable or not. I highly recommend you go for the manufacturer that has an adjustable seat. When your child is riding a balance bike, the main source of breaks will always be his feet. Though hand brakes can help to prevent injury and save his shoes. You shouldn’t encourage your toddler to use a handbrake. But if you plan on him riding the balance bike for several years, it’s a good idea to invest in one with a hand brake, in advance. This is because brakes are a nice feature for your older child as he can develop that skill before transferring to a pedal bike. So to me, the decision whether to have brakes or not should be based on your child’s age. Here’s a suggestion if you’re thinking of investing in one with a handbrake. To test the handbrake, try to activate the brake with your pinky finger. Why the pinky finger you ask? Because this simulates the strength of your child’s hand. I’m sure you get the drift now? Right? If it’s easy for you to compress with your pinky, then it will also be easy for your child. Finally, for safety purposes, all the brakes should be on the rear tire and activated using the right hand. The tires on your child’s balance bike will determine how smooth it will ride and whether it will maintain traction on different surfaces. 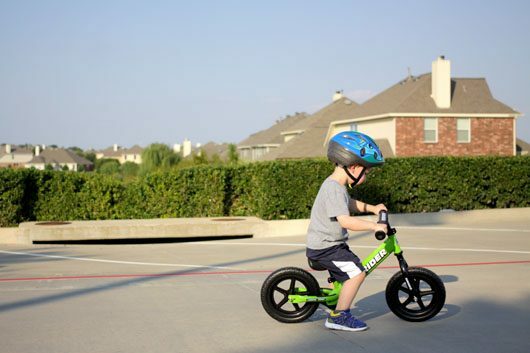 Most balance bikes use 12-inch tires. The bigger ones which are 14 and 16 inches are intended for grade-schoolers. Or tall preschoolers who might have already outgrown these bikes. You can also get smaller ones that are 10 inches, but I wouldn’t buy this one for my child as he will outgrow it quickly. Generally, the five types of tires are Air, Big Apple, Foam, Plastic, and Rubber. Foam and air (pneumatic) ones are the most popular. If you want to get more cushion, then go for air (or pneumatic) tires. They are popular for giving traction and being a good all-rounder. As far as treads go, you have access to a wide variety. For most kids, any will do. 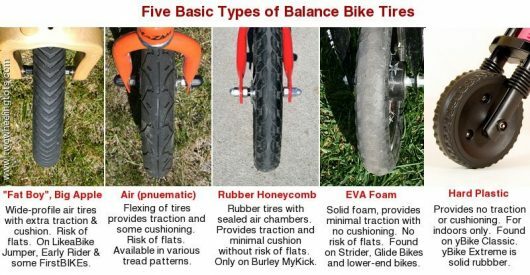 I hope the image below will help you choose the best balance bike’s tire suit for your toddler. : They are also known as FatBoy because they have a wide profile. They are the type that will give your child an added measure of traction (the grip of the tire on the road) and shock absorption. These ones are good for accommodating confident kids that enjoy jumps or tricks at the skate park. They do cost a pretty penny, but well worth it. These ones are sort of cheaper and lighter of the air tires. They never go flat and are puncture-proof. Seeing that there’s no air, to begin with, this shouldn’t come as a surprise, right? But they are fairly less comfortable than their air tires cousin because they somewhat lack in the shock-absorption department. They are cheap as dirt though if this is any consolation. Plastic tires are the lightest and hardest. There’s little to no traction on them and the tread is meaningless. Because of this, they are fairly uncommon. You’ll more likely find them in balance bikes that are meant for indoor use, only. These ones are somewhere between air and foam. You can think of them as a step up from the EVA foam. They are puncture-proof but the cushioning and traction are both better. This is because of the qualities of the material. Another consideration to make is to determine the weight of the balance bike. This may not be a big deal if your child is an experienced rider though. 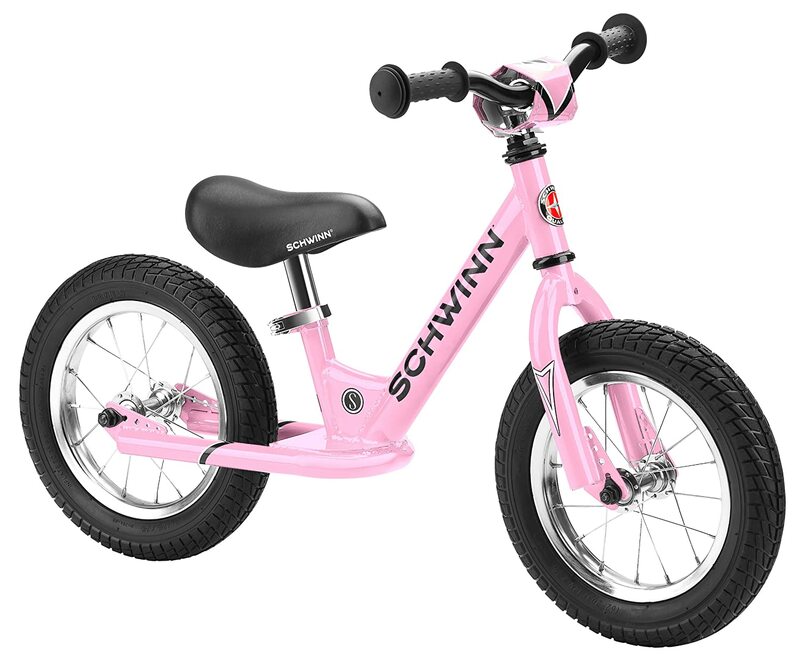 The recommendation is for your child to outweigh their bike by a minimum factor of three. If your child weighs 27 pounds, then their bike’s maximum weight should be 9lbs. Or if the bike that has caught your eye weighs 12lbs, then you need to get one that’s at least 36lbs. Easy as pie right? Or simply, you don’t want your child’s bike to weigh more than 30% of his weight. It’s important to know that the more features you add to your child’s bike, the heavier it will be. So, with that said, you may need to sacrifice some features in order to get the bike weight you desire. Though, this doesn’t explicitly mean that building a lightweight bike without eliminating features is not possible. It is, but it will require you to dig into your pockets to get high-end specialty components. Think about it, kids naturally lean forward to run. So, they need enough room to do so. Riding a balance bike involves running and gliding. A well-designed balance bike should allow ample room between the seat post and handlebars. This provides plenty of space for your child to extend his legs properly to run comfortably and naturally. Turning limiters work by blocking the handlebar and front wheel from completing a full revolution. This will prevent your child from taking sharp turns and keep the brake cable from getting twisted. There’s a lot of debate around whether they are beneficial or not. The argument given is that these act as training wheels for the handlebars and kids don’t really experience actual learning with the steering, not in place. They play a very small part so I don’t think they should be a deciding factor when you are buying a balance bike. Are they needed? If you’ve been looking at balance bikes you may have noticed that a majority of them don’t have footrests. This is because they are not needed. Most parents don’t see the need. 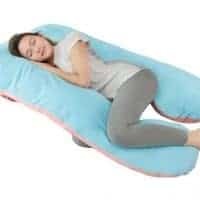 Usually, a proper designed footrest doesn’t hurt but a poorly designed one will definitely interfere with your child’s stride. This will, in turn, cause him to hit the back of his calf on the footrest while riding. As long as it doesn’t get in the way, it’s alright if it’s there. Bearings determine how fast and how smooth a tire spins around the axle. Some bearings have a rubber seal that will prevent water, dirt, and dust from entering the bearings. A bike with sealed bearings will experience less friction when spinning as your child is riding. This means that your child will enjoy a smoother ride while putting less effort. The catch is, sealed bearings don’t come easy on your pocket. They are nice to have but not required. The material used in your child’s balance bike impacts the weight of the bike. So this is also important. You can get balance bikes in metal alloys, wood, and composite frames, with metal being the most common. The cream-of-the-crop in bike frames is aluminum alloy 6061. Wood bikes are more environmentally friendly but are less adjustable than metal ones. So, there is really no exact answer to which material will make for the best balance bike for your toddler because each has its own pros and cons. This will depend on what fits your child and if he would love to ride on. For hand grips, you will need to check for a rubber grip with a knobby end. This way, your child’s hand will be protected when the handlebars run into a wall, trees, etc. and also protect his hands from hitting the ground during falls. Hand grips are pretty important for the safety of your little one, so you need to be cautious before buying any bike without protective bumpers. Bolts that are exposed, especially if your child is small-framed may become scratched and can scratch his inner legs during falls or when he’s riding. So, I believe I don’t have to say any more on this! Make sure you check on any exposed bolts before buying a balance bike for your child. Balance bikes come in a range of materials. I would recommend a metal frame model with pneumatic tires. The laminated wood balance biked don’t last when you expose them to cold or wet weather. As a customer, you have the right to ask the manufacturer to deal with any issues that may happen to your toddler’s balance bike. According to their terms and conditions, of course. Look at the company and the warranty, and make sure to find a company that you trust with a warranty that you feel comfortable about. A word of advice, a real deal bike usually has a warranty which lasts at least a couple of years. So once you have a good warranty, then you have peace of mind. The sooner you teach your child how to ride a balance bike, the faster he will master how to ride. Is your child capable of walking steadily on his own? If the answer is yes, then you should give them a try. Your child can start to learn how to ride a balance bike as young as 18 months. 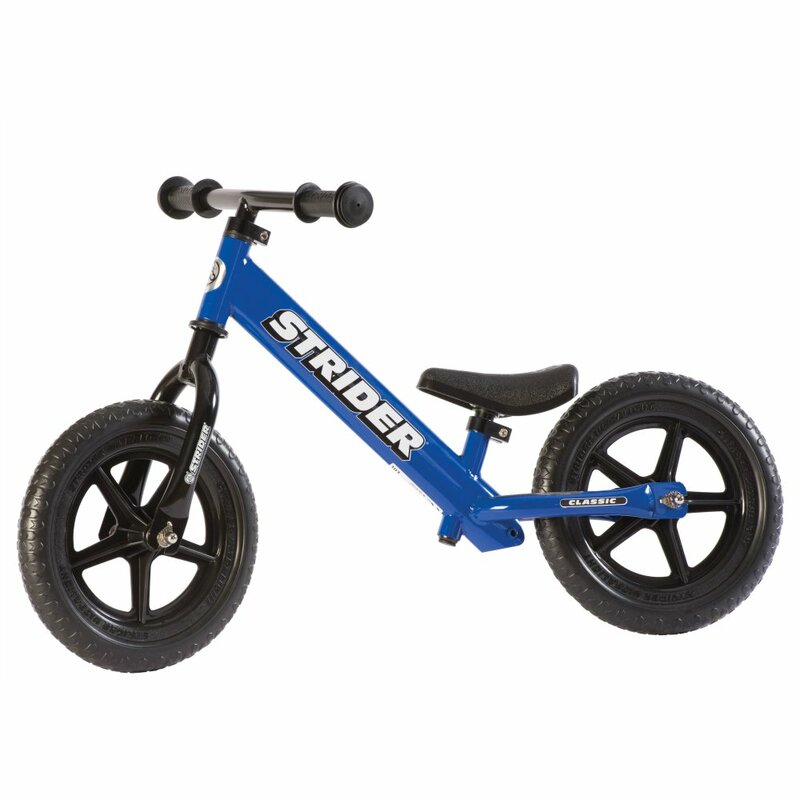 Price is also an important factor when you’re in the market to buy the best balance bike for your toddler. As you get started, get clear on your budget and get a bike that fits all your needs within your budget. You might not be able to get the best balance bike for your toddler within your budget, but if you look a little bit harder, you can find plenty of balance bikes in every price range that comes close and are still within your budget. So, don’t spend more than you need to. Your child must be tall enough to walk the bicycle while sitting comfortably in the seat, putting both feet flat on the ground. Your child first walks the bicycle while standing over the seat, then while sitting in the seat. Eventually, he/she will feel comfortable enough to increase speed and “scoot” while riding the bicycle. 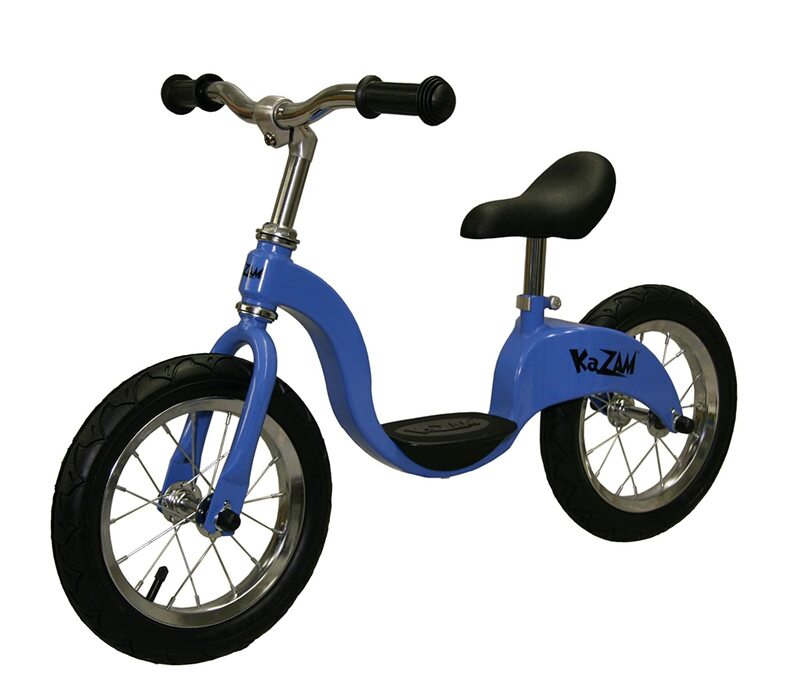 Lastly, your child will be able to lift both feet off the ground and cruise while balancing on the two wheels. When your child is starting out, please don’t hold the bike. If you need to offer support, lightly support your child by holding on to the back of their jacket or shirt. This way, they will get to get a sense of control and feel of the bike in order to learn what they need to do to balance it. This is a very popular question among parents of toddlers. So this will depend on your child’s understanding of the basics of riding a bike. But the estimated use of the balance bike is around 1-2 years. Since balance bikes can be used by a child as young as your 18-month-old, safety is key. It’s helpful for your new rider to start on open grassy areas or dirt paths. As he gains some confidence. Let your child put on stable closed footwear while riding their bike. Don’t allow your child to ride wearing flip-flops or even barefoot. Since their feet will be used frequently as brakes. Don’t forget a helmet for your child, this one is very very important. Even if your child puts up a fuss about it, don’t give in, he has to have his helmet on. Safety first, right? With that said, make sure the helmet is the right size. So that it doesn’t move around on his head. How will you know the right helmet size you ask? 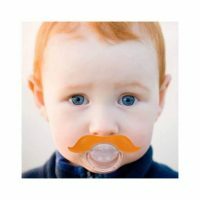 You can get this by measuring around your toddler’s head-one inch above the ear and right above the eyebrow. After you get the inches, you can find the right size helmet. When you put your child’s helmet on his head ask him if he can see the bottom rim of the helmet. Next, tell your child to open his mouth as wide as he can. Now adjust the length of the chin strap until it’s comfortably snug. Have your toddler stay clear off steep hills. I know you don’t want him to lose control and run into traffic! When your toddler is starting out, you need to remember not to hold the bike. You just need to lightly (only if needed) hold on to the back of his jacket or shirt. This way, he will get control, a feeling of the bike and what he needs to do to support it. Trust me, your child will pick up on this quickly. Something else, don’t rush your child to sit on the seat or to run and glide off the bat. It will come with practice and will depend on your child’s ability and age. Let your child try the balance bike on their own terms. Most toddlers will stand over the bike and walk it at first, could take a week or more. Then the next thing they might want to do is sitting and scooting the bike forward. The last stage of learning will be gliding and picking up their feet. 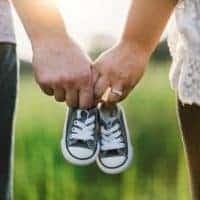 This process can take days or even a month for your toddler, but not to worry! As long as your child shows interest, he is learning and having fun, so don’t fret! Finally, always make sure you supervise your child’s riding. Remember, it still could be hard for your child to control speed and distance of vehicles until age 10, so your supervision is important. Also, I highly recommend that you dress your child in bright colored clothes. This makes them even the more visible, which will help prevent accidents. I do believe without a doubt that will all the information I have provided, your work is already cut out for you now and you’re well on your way to getting the best balance bike for your toddler. 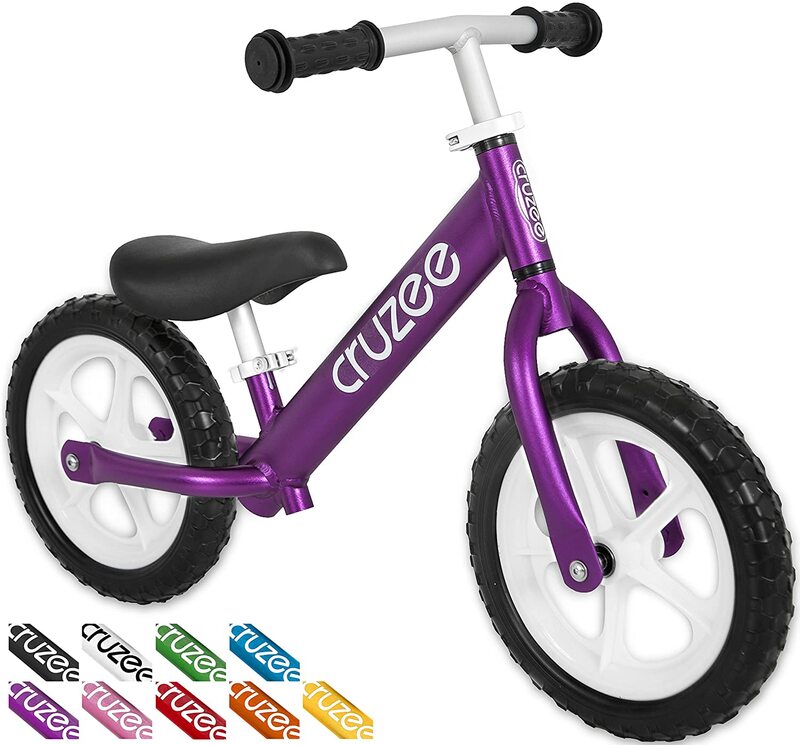 Check out our Article on Which Balance Bike To Get For Your Child – Best Balance Bike for 18 months old to 4 years old. This entry was posted in Balance Bike. Bookmark the permalink. How Long Are Condoms Good For After Manufacture?